We purchased our first 'show' boxer - Rockaway Super Showoff in 1985. Whilst we had a lot of fun with her it wasn't long before we bought our second boxer, Glamorsox Rambo Lad. Both were titled very quickly but Rambo was our first Best In Show winner and so begins our love and life as Phoenway Boxers. 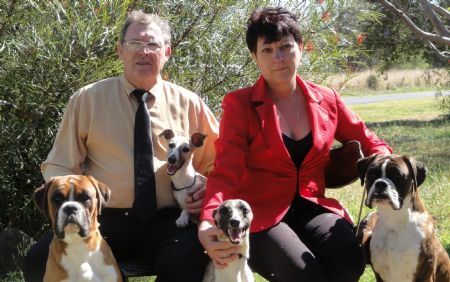 We eventually contacted David & Juanita Strachan with an enquiry into one of their pups and our friendship with the Thasrite Kennels grew helping us to where we are today. Our pride and joys were/are Grand Champion Phoenway Bak To Th Future, Grand Champion Phoenway Sea Worthy (pictured and unfortunately deceased), Champion Mud Sludge, Champion Phoenway You Beaut (deceased), Champion Phoenway Givitome Baby (deceased), Champion Thasrite Gold Dust (deceased), Champion Thasrite Shop Till Ya Drop and our young hopeful Boxalicious Maximus Orileous - the real gladiator.